Once upon a time there was a king and a queen, who were very sorry that they had no children,—so sorry that it cannot be told. At last, however, the Queen had a daughter. There was a very fine christening; and the Princess had for her godmothers all the fairies they could find in the whole kingdom (there were seven of them), so that every one of them might confer a gift upon her, as was the custom of fairies in those days. By this means the Princess had all the perfections imaginable. After the christening was over, the company returned to the King’s palace, where was prepared a great feast for the fairies. There was placed before every one of them a magnificent cover with a case of massive gold, wherein were a spoon, and a knife and fork, all of pure gold set with diamonds and rubies. But as they were all sitting down at table they saw a very old fairy come into the hall. She had not been invited, because for more than fifty years she had not been out of a certain tower, and she was believed to be either dead or enchanted. The King ordered her a cover, but he could not give her a case of gold as the others had, because seven only had been made for the seven fairies. The old fairy fancied she was slighted, and muttered threats between her teeth. One of the young fairies who sat near heard her, and, judging that she might give the little Princess some unlucky gift, hid herself behind the curtains as soon as they left the table. She hoped that she might speak last and undo as much as she could the evil which the old fairy might do. In the meanwhile all the fairies began to give their gifts to the Princess. The youngest gave her for her gift that she should be the most beautiful person in the world; the next, that she should have the wit of an angel; the third, that she should be able to do everything she did gracefully; the fourth, that she should dance perfectly; the fifth, that she should sing like a nightingale; and the sixth, that she should play all kinds of musical instruments to the fullest perfection. 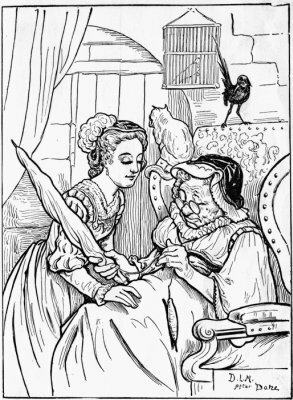 The old fairy’s turn coming next, her head shaking more with spite than with age, she said that the Princess should pierce her hand with a spindle and die of the wound. This terrible gift made the whole company tremble, and everybody fell a-crying. "Assure yourselves, O King and Queen, that your daughter shall not die of this disaster. It is true, I have no power to undo entirely what my elder has done. The Princess shall indeed pierce her hand with a spindle; but, instead of dying, she shall only fall into a deep sleep, which shall last a hundred years, at the end of which a king’s son shall come and awake her." The King, to avoid the misfortune foretold by the old fairy, issued orders forbidding any one, on pain of death, to spin with a distaff and spindle, or to have a spindle in his house. About fifteen or sixteen years after, the King and Queen being absent at one of their country villas, the young Princess was one day running up and down the palace; she went from room to room, and at last she came into a little garret on the top of the tower, where a good old woman, alone, was spinning with her spindle. This good woman had never heard of the King’s orders against spindles. "What are you doing there, my good woman?" said the Princess. "I am spinning, my pretty child," said the old woman, who did not know who the Princess was. "Ha!" said the Princess, "this is very pretty; how do you do it? Give it to me. Let me see if I can do it. She had no sooner taken it into her hand than, either because she was too quick and heedless, or because the decree of the fairy had so ordained, it ran into her hand, and she fell down in a swoon. The good old woman, not knowing what to do, cried out for help. People came in from every quarter; they threw water upon the face of the Princess, unlaced her, struck her on the palms of her hands, and rubbed her temples with cologne water; but nothing would bring her to herself. Then the King, who came up at hearing the noise, remembered what the fairies had foretold. He knew very well that this must come to pass, since the fairies had foretold it, and he caused the Princess to be carried into the finest room in his palace, and to be laid upon a bed all embroidered with gold and silver. One would have taken her for a little angel, she was so beautiful; for her swooning had not dimmed the brightness of her complexion: her cheeks were carnation, and her lips coral. It is true her eyes were shut, but she was heard to breathe softly, which satisfied those about her that she was not dead. "Let me see if I can do it." The King gave orders that they should let her sleep quietly till the time came for her to awake. The good fairy who had saved her life by condemning her to sleep a hundred years was in the kingdom of Matakin, twelve thousand leagues off, when this accident befell the Princess; but she was instantly informed of it by a little dwarf, who had seven-leagued boots, that is, boots with which he could stride over seven leagues of ground at once. The fairy started off at once, and arrived, about an hour later, in a fiery chariot drawn by dragons. The King handed her out of the chariot, and she approved everything he had done; but as she had very great foresight, she thought that when the Princess should awake she might not know what to do with herself, if she was all alone in this old palace. This was what she did: she touched with her wand everything in the palace (except the King and Queen),—governesses, maids of honor, ladies of the bedchamber, gentlemen, officers, stewards, cooks, undercooks, kitchen maids, guards with their porters, pages, and footmen; she likewise touched all the horses which were in the stables, the cart horses, the hunters and the saddle horses, the grooms, the great dogs in the outward court, and little Mopsey, too, the Princess’s spaniel, which was lying on the bed. As soon as she touched them they all fell asleep, not to awake again until their mistress did, that they might be ready to wait upon her when she wanted them. The very spits at the fire, as full as they could hold of partridges and pheasants, fell asleep, and the fire itself as well. [Pg 19]All this was done in a moment. Fairies are not long in doing their work. And now the King and Queen, having kissed their dear child without waking her, went out of the palace and sent forth orders that nobody should come near it. These orders were not necessary; for in a quarter of an hour’s time there grew up all round about the park such a vast number of trees, great and small, bushes and brambles, twining one within another, that neither man nor beast could pass through; so that nothing could be seen but the very top of the towers of the palace; and that, too, only from afar off. Every one knew that this also was the work of the fairy in order that while the Princess slept she should have nothing to fear from curious people. After a hundred years the son of the King then reigning, who was of another family from that of the sleeping Princess, was a-hunting on that side of the country, and he asked what those towers were which he saw in the middle of a great thick wood. Every one answered according as they had heard. Some said that it was an old haunted castle, others that all the witches of the country held their midnight revels there, but the common opinion was that it was an ogre’s dwelling, and that he carried to it all the little children he could catch, so as to eat them up at his leisure, without [Pg 20]any one being able to follow him, for he alone had the power to make his way through the wood. "May it please your royal Highness, more than fifty years since I heard from my father that there was then in this castle the most beautiful princess that was ever seen; that she must sleep there a hundred years, and that she should be waked by a king’s son, for whom she was reserved." The young Prince on hearing this was all on fire. He thought, without weighing the matter, that he could put an end to this rare adventure; and, pushed on by love and the desire of glory, resolved at once to look into it. As soon as he began to get near to the wood, all the great trees, the bushes, and brambles gave way of themselves to let him pass through. He walked up to the castle which he saw at the end of a large avenue; and you can imagine he was a good deal surprised when he saw none of his people following him, because the trees closed again as soon as he had passed through them. However, he did not cease from continuing his way; a young prince in search of glory is ever valiant. He came into a spacious outer court, and what he saw was enough to freeze him with horror. A frightful silence reigned over all; the image of death was everywhere, and there was nothing to be seen but what seemed to be the outstretched bodies of dead men and animals. He, however, very well knew, by the ruby faces and pimpled noses of the porters, that they were only asleep; and their goblets, wherein still remained some drops of wine, showed plainly that they had fallen asleep while drinking their wine. He then crossed a court paved with marble, went up the stairs, and came into the guard chamber, where guards were standing in their ranks, with their muskets upon their shoulders, and snoring with all their might. He went through several rooms full of gentlemen and ladies, some standing and others sitting, but all were asleep. He came into a gilded chamber, where he saw upon a bed, the curtains of which were all open, the most beautiful sight ever beheld—a princess who appeared to be about fifteen or sixteen years of age, and whose bright and resplendent beauty had something divine in it. He approached with trembling and admiration, and fell down upon his knees before her. "Is it you, my Prince? You have waited a long while." The Prince, charmed with these words, and much more with the manner in which they were spoken, knew not how to show his joy and gratitude; he assured her that he loved her better than he did himself. Their discourse was not very connected, but they were the better pleased, for where there is much love there is little eloquence. He was more at a loss than she, and we need not wonder at it; she had had time to think of what to say to him; for it is evident (though history says nothing of it) that the good fairy, during so long a sleep, had given her very pleasant dreams. In short, they talked together for four hours, and then they said not half they had to say. In the meanwhile all the palace had woke up with the Princess; every one thought upon his own business, and as they were not in love, they were ready to die of hunger. The lady of honor, being as sharp set as the other folks, grew very impatient, and told the Princess aloud that the meal was served. The Prince helped the Princess to rise. She was entirely and very magnificently dressed; but his royal Highness took care not to tell her that she was dressed like his great-grandmother, and had a high collar. She looked not a bit the less charming and beautiful for all that. They went into the great mirrored hall, where they supped, and were served by the officers of the Princess’s household. The violins and haut boys played old tunes, but they were excellent, though they had not been played for a hundred years; and after supper, without losing any time, the lord almoner married them in the chapel of the castle. They had but very little sleep—the Princess scarcely needed any; and the Prince left her next morning to return into the city, where his father was greatly troubled about him. The Prince told him that he lost his way in the forest as he was hunting, and that he had slept in the cottage of a charcoal-burner, who gave him cheese and brown bread. The King, his father, who was a good man, believed him; but his mother could not be persuaded that it was true; and seeing that he went almost every day a-hunting, and that he always had some excuse ready for so doing, though he had been out three or four nights together, she began to suspect that he was married; for he lived thus with the Princess above two whole years, during which they had two children, the elder, a daughter, was named Dawn, and the younger, a son, they called Day, because he was a great deal handsomer than his sister. The Queen spoke several times to her son, to learn after what manner he was passing his time, and told him that in this he ought in duty to satisfy her. But he never dared to trust her with his secret; he feared her, though he loved her, for she was of the race of the Ogres, and the King married her for her vast riches alone. It was even whispered about the Court that she had Ogreish inclinations, and that, whenever she saw little children passing by, she had all the difficulty in the world to prevent herself from falling upon them. And so the Prince would never tell her one word. But when the King was dead, which happened about two years afterward, and he saw himself lord and master, he openly declared his marriage: and he went in great state to conduct his Queen to the palace. They made a magnificent entry into the capital city, she riding between her two children. "I intend to eat little Dawn for my dinner to-morrow." "O! madam!" cried the head cook. "I will have it so," replied the Queen (and this she spoke in the tone of an Ogress who had a strong desire to eat fresh meat), "and will eat her with a sharp sauce." The poor man, knowing very well that he must not play tricks with Ogresses, took his great knife and went up into little Dawn’s chamber. She was then nearly four years old, and came up to him, jumping and laughing, to put her arms round his neck, and ask him for some sugar-candy. Upon which he began to weep, the great knife fell out of his hand, and he went into the back yard and killed a little lamb, and dressed it with such good sauce that his mistress assured him she had never eaten anything so good in her life. He had at the same time taken up little Dawn and carried her to his wife, to conceal her in his lodging at the end of the courtyard. Eight days afterwards the wicked Queen said to the chief cook, "I will sup upon little Day." He answered not a word, being resolved to cheat her again as he had done before. He went to find little Day, and saw him with a foil in his hand, with which he was fencing with a great monkey: the child was then only three years of age. He took him up in his arms and carried him to his wife, that she might conceal him in her chamber along with his sister, and instead of little Day he served up a young and very tender kid, which the Ogress found to be wonderfully good. "I will eat the Queen with the same sauce I had with her children." Now the poor chief cook was in despair and could not imagine how to deceive her again. The young Queen was over twenty years old, not reckoning the hundred years she had been asleep: and how to find something to take her place greatly puzzled him. He then decided, to save his own life, to cut the Queen’s throat; and going up into her chamber, with intent to do it at once, he put himself into as great fury as he possibly could, and came into the young Queen’s room with his dagger in his hand. He would not, however, deceive her, but told her, with a great deal of respect, the orders he had received from the Queen-mother. "Do it; do it," she said, stretching out her neck. "Carry out your orders, and then I shall go and see my children, my poor children, whom I loved so much and so tenderly." For she thought them dead, since they had been taken away without her knowledge. "No, no, madam," cried the poor chief cook, all in tears; "you shall not die, and you shall see your children again at once. But then you must go home with me to my lodgings, where I have concealed them, and I will deceive the Queen once more, by giving her a young hind in your stead." Upon this he forthwith conducted her to his room, where, leaving her to embrace her children, and cry along with them, he went and dressed a young hind, which the Queen had for her supper, and devoured with as much appetite as if it had been the young Queen. She was now well satisfied with her cruel deeds, and she invented a story to tell the King on his return, of how the Queen his wife and her two children had been devoured by mad wolves. One evening, as she was, according to her custom, rambling round about the courts and yards of the palace to see if she could smell any fresh meat, she heard, in a room on the ground floor, little Day crying, for his mamma was going to whip him, because he had been naughty; and she heard, at the same time, little Dawn begging mercy for her brother. The Ogress knew the voice of the Queen and her children at once, and being furious at having been thus deceived, she gave orders (in a most horrible voice which made everybody tremble) that, next morning by break of day, they should bring into the middle of the great court a large tub filled with toads, vipers, snakes, and all sorts of serpents, in order to have the Queen and her children, the chief cook, his wife and maid, thrown into it, all of whom were to be brought thither with their hands tied behind them. They were brought out accordingly, and the executioners were just going to throw them into the tub, when the King, who was not so soon expected, entered the court on horseback and asked, with the utmost astonishment, what was the meaning of that horrible spectacle. No one dared to tell him, when the Ogress, all enraged to see what had happened, threw herself head foremost into the tub, and was instantly devoured by the ugly creatures she had ordered to be thrown into it to kill the others. The King was of course very sorry, for she was his mother; but he soon comforted himself with his beautiful wife and his pretty children. The version above of Sleeping Beauty in the Woods is from Project Gutenberg. As is usual in most English translations of Charles Perrault’s Tales from Mother Goose, the translator omits the moral of the story in verse. All of the Tales from Mother Goose have one, the one for Little Red Riding Hood perhaps the most engaging. Here then is the moral from La Belle au Bois Dormant first in the original French, followed by my own loose translation in English. De lui prêcher cette morale. Who will sleep so tranquilly. And that there is nothing to lose by waiting. To preach them that moral. What’s delightful in the moralite of Perrault is the implied suggestion that there is a lot more love-making going on both before and after marriage than the nominal morals of the time would allow. And his implication of willing participation in these festivities. Perrault’s little verse moralites are so very modern.